Emitted by fires, black carbon aerosols (rBC) perturb the atmosphere’s physical and chemical properties and are climatically active. 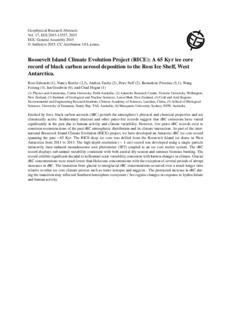 Sedimentary charcoal and other paleo-fire records suggest that rBC emissions have varied significantly in the past due to human activity and climate variability. However, few paleo rBC records exist to constrain reconstructions of the past rBC atmospheric distribution and its climate interaction. As part of the international Roosevelt Island Climate Evolution (RICE) project, we have developed an Antarctic rBC ice core record spanning the past 65 Kyr. The RICE deep ice core was drilled from the Roosevelt Island ice dome in West Antarctica from 2011 to 2013. The high depth resolution ( 1 cm) record was developed using a single particle intracavity laser-induced incandescence soot photometer (SP2) coupled to an ice core melter system. The rBC record displays sub-annual variability consistent with both austral dry-season and summer biomass burning. The record exhibits significant decadal to millennial-scale variability consistent with known changes in climate. Glacial rBC concentrations were much lower than Holocene concentrations with the exception of several periods of abrupt increases in rBC. The transition from glacial to interglacial rBC concentrations occurred over a much longer time relative to other ice core climate proxies such as water isotopes and suggests . The protracted increase in rBC during the transition may reflected Southern hemisphere ecosystem / fire regime changes in response to hydroclimate and human activity.